As we were chatting, we couldn’t help but notice these fabulous contraptions behind us. Were they sculpture? A modern take on the state of the world? A fashion statement? The answer is all of the above. These shoes (!) were designed by starchitect Zaha Hadid for Brazilian shoe company, Melissa. 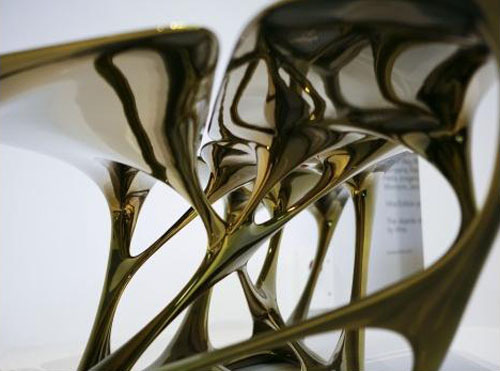 Made from plastic and rubber, the fluid design and organic, sweeping shapes of the shoes echo not only Hadid’s architecture, but also the furniture and sculptures she creates. Who wouldn’t want to walk in the shoes of a Pritzker prize-winning architect? Additional cocktail party impressers: Vivienne Westwood also designed a line for Melissa. Zaha Hadid also dabbled in running shoes for Lacoste. Opera House image source. Space bar image source. Table image source. Purple shoe image source. Silver shoe image source.